When government workers are temporarily promoted shortly before retirement, do they get the same pension increase as a permanent worker in the job — or would that open the door for “spiking,” the intentional tweaking of final pay to boost pensions? The issue split the CalPERS board this month in a 6-to-4 vote approving anti-spiking regulations for Gov. Brown’s pension reform legislation, which covers most state and local government workers hired since Jan. 1 last year. While giving new hires lower pensions, the Public Employees Pension Reform Act also limits their ability to spike with a list of items that are not “pensionable compensation,” such as overtime, bonuses and pay for unused sick leave and vacation. “Temporary upgrade pay” was not on the list. After talks with labor, employers and the Brown administration reached no consensus, the CalPERS staff, reversing its previous position, drafted regulations making temporary upgrade pay pensionable. The split vote sent the regulations, approved as drafted, out for a 45-day public comment period. The new rules and the comments will come back to the board for final approval or changes triggering another comment period. “If someone is put into a higher-paying position at the end of their career, not on merit, that seems to present the potential for pension spiking,” said board member Richard Gillihan, a Brown administration official who voted “no” on the new rules. If employers left positions open for retiring employees, CalPERS could look at the problem case-by-case, replied Danny Brown, a staff member. He said temporary “out-of-class” work can be common, and staff felt extra duties deserve the usual extra benefits. The reform limits spiking by using the highest three-year average of pay to calculate pensions for new hires, rather than the highest single-year pay used for previous hires not covered by the reform. “If you were in a temporary upgrade long enough that it impacts your three-year final comp, it’s been more than an ad hoc promotion,” said board member J.J. Jelincic, referring to the reform disallowing “any one-time or ad hoc” pay. Board member George Diehr disagreed, citing a report issued last month by the nonpartisan Legislative Analyst’s Office, “State Worker Salary, Health Benefit, and Pension Costs,” specifically pages 11 and 12. 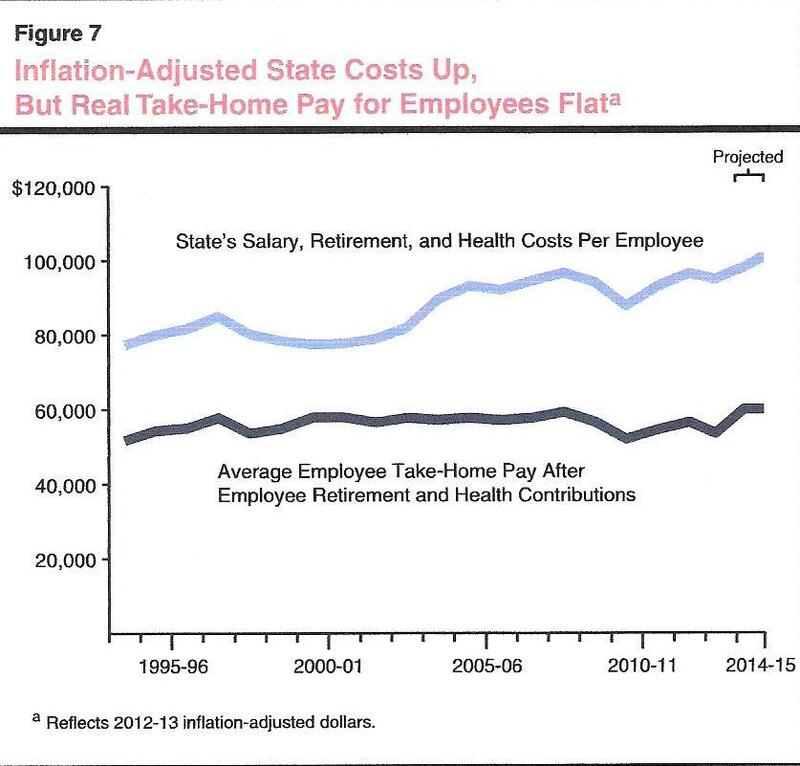 Diehr said the report shows that when adjusted for inflation the average state worker’s take-home pay (after pension, health, Social Security and Medicare payments) has been relatively flat over the last 20 years. But the report said the inflation-adjusted state cost of providing salary and health and retirement benefits for the average employee during the last two decades increased from about $77,000 a year to more than $100,000. After the pension reform bill, AB 340, was signed by Brown, CalPERS issued a circular letter in December 2012 on “pensionable compensation” for new hires covered by the reform. Six types of pay that are pensionable for workers hired before the reform took effect Jan. 1, 2013, were excluded for workers hired after that date, including bonuses, employee pension contributions paid by employers and temporary upgrade pay. Why did the CalPERS staff reverse its position and make temporary upgrade pay pensionable in the new regulations? A reason given in a staff report to the board is based on one of the many provisions in a “cleanup” bill, SB 13, that made “technical changes” to clarify the legislative intent of the reform bill. Unions might be expected to push for more pensionable pay items that boost pensions. But the cleanup bill provision allows state worker unions to exclude pay items from pensionable compensation through collective bargaining. The circular letter in 2012 excluded temporary upgrade pay because it was characterized as “ad hoc” due to typically “limited duration,” the staff report said, and the reform bill prohibits “ad hoc” pay items. This month the CalPERS benefits committee removed temporary upgrade pay before sending the draft regulations to the full board, apparently intending to give the disputed issue more study. Voting for the complete draft regulations recommended by the staff were Bilbrey, Jelincic, Priya Mathur, Ron Lind, Steve Coony for state Treasurer Bill Lockyer and Terry McGuire for state Controller John Chiang. Voting “no” were Gillihan, Diehr, Richard Costigan and Bill Slaton. Henry Jones was absent. Feckner customarily does not vote unless there is a tie. A seat designated for a governor appointee representing the insurance industry is vacant. The ability to bargain to exclude items from pensionable compensation is not the only special treatment under pension reform given to state workers, but not to the other two CalPERS member groups: local government and non-teaching school employees. The pension reform requires that most new hires pay at least 50 percent of their pension “normal cost,” the amount needed to cover future pension obligations earned during a year but not the debt or “unfunded liability” from previous years. New state workers are excluded from the requirement to pay 50 percent of the normal cost, with the exception of employees of the Legislature, California State University and the courts. This month the CalPERS board approved a rate increase for new hires in the Legislature and CSU peace officer and firefighter plans, up 0.5 percent of pay to a total of 11 percent of pay. This entry was posted on April 28, 2014 at 7:24 am and is filed under CalPERS, Operations, Spiking. You can follow any responses to this entry through the RSS 2.0 feed. You can skip to the end and leave a response. Pinging is currently not allowed. The salary used to calculate a pension must be a full-year in duration. Don’t try to fix something that isn’t broken. EVERYTHING is “broken” (form the Taxpayer’s standpoint) when it comers to Public Sector pensions and benefits. Clearly the greedy pigs are looking for another loophole to “spike” their pensions and screw the taxpayers. Approve this nonsense and everyone with even the most minimal political/Union “connections” will be “temporarily” promoted before retiring … even if a total incompetent who should have been fired years ago. Any pension award calculation that doesn’t arise out of how the pension fund earns constitutes a redistribution of income from other pensioners and/or taxpayers. Pensions calculations should use the time value of money, hence earnings at the end of a person’s work career should be appropriately discounted in calculation. That would make the spiking issue moot. It would also greatly diminish the “competitive compensation” arguments that have lead to undeserved wage increases in the public sector, because moving to new jurisdiction that pays more can make the real increase more a function of lifetime pension benefits than the increase in pay received while working. A responsible public entity would not temporarily promote an incompetent for the sake of getting a larger retirement for that incompetent. There is no such loophole. Most who get to the top rung on their, respective, career ladder have spent a full career getting there–it doesn’t just magically, happen at retirement time–it was because it took a long time. We should all be so fortunate to have made it before we retired. SeeSaw, Hogwash …hey, he’s my brother-in -law. Many employees were asked to fill vacant positions during hiring freezes, long term illnesses, administrative leaves. These people did the job, received the temporary pay and used these assignments as OJT. What is so wrong about having it be part of their final compensation upon their retirement? The way I see it, the people who were in position to write their own pay (take note of recent listings of pay packages for city managers in Southern California) are the ones that should be looked at as the issue. The fact that they did jail time and still get a retirement (albeit reduced) is an issue as well. Not the Joe Blow that filled in and did the job. To the person who refers to public employees as “greedy pigs” You should walk a day in the shoes of a public employee and do the work for the people of California. Take a bullet, Be assaulted by students in the classroom, Clean up after the slobs at a beach, Take care of the unwanted, Deal with the bully customer on a daly basis, Get assaulted at work on numerous occasions, Clean up the dead animals on the side of the road, Put out the fires, etc. Who do you call when you need help? A “Greedy Pig” public employee! Jennifer, Oh please, Those are the requirements of the jobs, for which they are MORE THAN appropriately compensated in CASH PAY. There is zero justification for their enormously overstuffed pension & benefit ….. ALWAYS multiples greater than what Private Sector workers get ….. let alone making those pensions even MORE excessive by their temporarily filling a higher level position. The Taxpayers are ALWAYS the sucker in the equation. I have seen both nepotism and cronyism in the public sector TL, and it is no different than what goes on in the private sector–fact is, unlike the public sector, managers in the private sector can hire all the brother-in-laws they want. I personally have no problem with either-type situation, if the person being hired is qualified to do the job. I stick with my original thought about promotions for the purpose of larger retirement–its true that it happens sometimes that someone retiring just got to the top rung a year or few months before they retired–that’s because they worked their whole careers to get to that spot. The final calculation requires averaging the highest earned year’s salary–the promotee doesn’t just get to take that salary to the bank. (And, with PEPRA now in effect, it is the average of three-year’s salaries). No competent public entity promotes an incompetent worker in order to get him/her a bigger retirement–chances are, no incompetent worker is going to be in that position, when a promotional opportunity arises. jskdn: If a particular worker makes a particular salary until June of the final year and a higher salary for the rest of the year, the two are averaged for the final calculation–what you recommend is already being done. If subject retiree didn’t get the promotion until October and retired in Dec. the salary for the last two months is averaged in with the previous 10 months. With PEPRA it is three years worth of salary. SeeSaw, Does the 3-yr average period for pensionable compensation apply to workers employed BEFORE PEPRA was enacted ? I don’t think so–I think the 3-yr averaging became effective for new hires when PEPRA became effective. I should have stated, also, that the one-year average rule applies to the highest salary–such could have occurred before the employee retired–there were some demotions after the economic crash, due to funding losses of the cities–the abolishment of Redevelopment caused chaos with many cities. SeeSaw, That’s what I thought. So ……… do you think they are promoting new workers over the more experienced ones? In your earlier comment you said … “The final calculation requires averaging the highest earned year’s salary–the promotee doesn’t just get to take that salary to the bank. (And, with PEPRA now in effect, it is the average of three-year’s salaries). Thank you for fessing up that INDEED you should have mentioned that fact as the taxpayers will likely get ZERO benefit from that 3 year averaging for MANY MANY years …. with ANY spiking being exacerbated by the continued 1-year period (applicable to pre-PEPRA employees) for a LONG LONG time. You are a riot, TL. The public entities could behead all of the pre-PEPRA employees, and it still would not be enough for you. SeeSaw, I have nothing against any Public Sector workers and respect those who work hard. But as I’ve said many times before before, the WORKERS are the financial recipients of the Union/politician collusion and self-dealing that resulted in the granting of their grossly excessive pensions & benefits, so THAT’s where the taxpayers must go to take it back….and be it voluntarily or by insolvency/bankruptcy, it WILL happen. Who are the ones who work hard and who are those that are recipients of the, “Union/politician collusion and self-dealing”? Do you look at the crystal ball on your table every night and see any Public Sector workers you respect? You seem to dwell on the persecuted private sector, but want no discussion of public sector abuse. Leninist through and through. You would have flourished in post Czarist Russia. – It should be noted that none of these items – overtime, bonuses and pay for unused sick leave and vacation are included under the current CalPERS plan. I guess these items were included to make it appear CalPERS is actually excluding something/doing something, when they clearly are not. – “Temporary Upgrade Pay” can also be called “Out of Classification Pay”, or “Acting Pay”. Employees receive additional compensation anytime they fill-in for someone with a higher rank, or position. While the additional PAY and Work Experience should be enough, especially for someone seeking a higher position with the comenserate increased pay scale. Apparently that isn’t the case as the Unions & CalPERS search High & Deep for loopholes. What they’re saying is those additional dollars should also apply toward their pension because that’s the way it’s always been done. These different classifications of temporary pay, and those additional dollars in compensation applying toward their pension payout, is the pinnacle of Arrogance on the part of both the Public Employee Unions and their Members. Enough will never be Enough! Unfortunately nobody seems to have picked-up on the larger and more important story contained within Mr. Mendel’s article. I hope people re-read the article in the context of just how CORRUPT CalPERS is (CalPERS Staff and the CalPERS Board). The ones who work hard know who they are as well as those who goof off. EVERY Public Sector worker ….. via their UNIVERSALLY excessive pensions and benefits …. and often cash pay as well. I find it so interesting how the US Postal workers are picketing Staples because they are “threatening” their $25/hr jobs (+ pensions & benefits) by selling stamps and certain other Postal services..
Gee, perhaps what Postal workers do really doesn’t justify the compensation they are paid. Market demands should set compensation, not Union demands and ESPECIALLY not in the Public Sector where nobody on EITHER side of the compensation negotiations is rightfully looking out for Taxpayer interests. – What makes you think that, S Moderation Douglas? When the pension fund was 132 percent funded was that all your money? – That is complete bull! SB 400 alowed the unions to steal the 32 percent of pension dollars above the 100% funding level that represented TAXPAYER funds/RESERVES in the event of a market downturn. None of that belonged to you or any other Public Employee Union Member, yet those taxpayer $$$$ are now in your pocket/wallet/bank account/or pooled pension plan. The money was stolen from taxpayers by CalPERS and the Public Employee Unions, with the help of our subservient politicians. Pensions need to be calculated over the entire career of the person, not just on their highest salary years. What sense does it make for the state to pay say an extra $10k a year for a few years, only to have to keep making that same extra $10k payment for the next 20? Similarly this should not be a local issue at all. It needs to be state at minimum and should really be federal. No more spiking. Plus recalculate the former spikes to be subtracted from future pay. That will help fix the system.